Of all the celebrated superstar chefs who rose to prominence in the nineties, Daniel Boulud is arguably the most cautious, the most deliberate, the one who holds his cards closest to the vest. 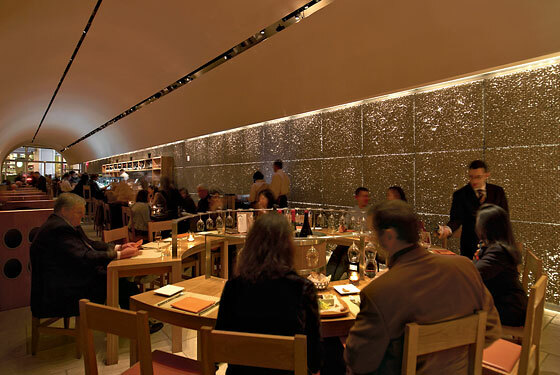 Until the opening of his new venture, Bar Boulud, he operated a mere three restaurants in Manhattan, compared with six (and counting) for Jean-Georges Vongerichten and for those boisterous fine-dining entrepreneurs Mario Batali and Joe Bastianich. Unlike Jean-Georges, or the omnivorous Batali, Boulud has never deviated very far from his culinary roots. He is the last of this city’s great classical chefs, a Frenchman who traces his lineage back through the glory days of Le Cirque to the celebrated regional cooking of his hometown, Lyon. Yes, Daniel has outlets now in Vegas and Palm Beach, but in this country, his real terroir has always been that traditional bastion of New York fine dining, the Upper East Side. And his bedrock clientele are the bankers, lawyers, and assorted fat cats who, once upon a time, set the standard for the style of dining we used to call haute cuisine. But tastes change, and Daniel, in his deliberate, careful way, is changing with them. The great chef has always been a connoisseur of down-home cooking. His high-minded iteration of pork belly (at Daniel) is a legend among pork hounds, and the famous DB burger (at DB Bistro) began a trend in haut bourgeois hamburgers that has now spun hopelessly out of control. But Bar Boulud, which opened early this year in an arched, cavernlike space across from Lincoln Center, is Daniel’s first restaurant explicitly constructed with hoi polloi in mind. Designed to resemble a swanky wine cellar, the long, chalk-colored room seats 100, most of them at elegantly utilitarian blonde-wood booths and an extended, slightly cramped, first-come-first-served bar. The menu is crowded with old brasserie standbys, like steak-frites, boudin blanc, and coq au vin, none of which costs over $30. The waiters don’t wear jackets, or even ties, and the walls are decorated not with the usual Euro-style frippery but with a series of framed purple blotches, which turn out to be digitally rendered tablecloth stains of famous French wines. Wine is one centerpiece of Boulud’s casual-dining model, and the other is that rusticated peasant specialty, charcuterie. The restaurant’s superb cold meats and pâtés are the work of Sylvain Gasdon, an acolyte of the wunderkind Paris charcuterie chef Gilles Verot, and it’s safe to say that in New York we’ve never tasted anything like them. When the “degustation” sample platter arrived, the dignified gastronomes at my table put down their glasses of Sicilian wine and began grappling for pink wedges of cognac-infused country pâté (“pâté grand-mère”) and a delicious assortment of jellied terrines made with inventive ingredients like beef cheeks, pressed rabbit, even slow-cooked lamb blended with chunks of sweet potato and spices from Morocco. Verot is the only chef I know who has his own signature brand of headcheese (the excellent “fromage de tête ‘Gilles Verot’ ”), but his greatest achievement, it was agreed, is the “pâté grand-père,” a rich, wine-colored creation made with truffles, port, a touch of foie gras, and shreds of coarse-cut pork. After these promising early fireworks, however, the food at Bar Boulud proceeds, curiously, to slide off a cliff. My eagerly awaited portion of pork belly was crispy enough, but hard as rocks and almost too fatty to eat (which, for this critic, is saying something). After that comes the tartare de boeuf Parisien, which cost $22 (or $65 with black truffles), tasted vaguely of the refrigerator, and was the size of a peewee hockey puck. The escargot I sampled were properly drowned in garlic and butter, but that other brasserie warhorse, the salade frisée, was dripping with dressing, studded with too many fatty pork lardons, and, for good measure, topped with a few too many random chunks of chicken liver. A similar lack of delicacy attended the thick, slightly bland brew of sunchokes and mushrooms called “soupe de topinambour.” One of the sophisticates at my table took a few prim sips, then pushed it aside. “This tastes like first-class airline food,” she said. This is a harsh indictment for a chef of Boulud’s stature, but then cooking for crowds is a tricky business (as any first-class airline chef will tell you), and franchising always has its costs. Daniel has a genius for imbuing earthy farmhouse recipes with his own light, gourmet touch, but at this early date, the entrées at Bar Boulud could come from any number of semi-reputable bistros around town. A fish-and-chips approximation called beignets de mérou has none of the fluffy, fried lightness of a real beignet, and comes to the table with a stale helping of root-vegetable chips. Other fish dishes, like salmon (in a wine sauce) and skate (stuffed with mushrooms), are diligently prepared but unremarkable, and so are the potted versions of lamb navarin and coq au vin, both set in similar, tar-thick reductions. My favorite entrée was the boudin blanc (“like veal custard,” someone said), but the frites of the steak-frites were flaccidly cooked, and the “natural chicken” in my otherwise well-prepared poulet rôti had no natural taste at all. If this generic bistro grub gets you down, it’s possible to drown your sorrows in Bar Boulud’s impressively deep wine list. But this, too, has its costs. For an ambitious, big-city wine bar, the selections by the glass are relatively meager, and the small carafe “quartino,” so popular among wine geeks, isn’t available. High rollers can blow $4,900 on a bottle of ’55 Leroy Chambertin, though whether they’ll want to pair this lofty Burgundy with a dinner of garden-variety coq au vin remains to be seen. The desserts are mostly ice-cream coupes and slices of tarts and pies, which seem designed to be consumed on the fly, or before catching a show. The best tend to have chocolate themes—try the foamy, hazelnut-flavored chocolate noisette and the tarte mocha, flecked with gold leaf. At lunchtime, there’s also a nice, updated version of the classic île flottante, cut in a wedge like a piece of pie and served in a pool of crème anglaise. Like the Verot-inspired charcuterie, this great dessert strikes that delicate balance of expedience and style that, for even the most accomplished chef, is harder than it looks. Hours: Dinner, 5 to 11 p.m. daily; lunch, noon to 3:30 p.m. Monday through Friday; brunch, 11 a.m. to 3:30 p.m. Saturday and Sunday. Prices: Entrées, $22 to $28; appetizers, $8 to $13. Ideal Meal: Pâté grand-père, boudin blanc, dark-chocolate tart or île flottante. Note: If you spy a serving of pricey, elusive, and recently legalized Ibérico ham on the charcuterie menu, order it. Scratchpad: Boulud’s spotty, generic menu is bound to improve with time. But right now, the excellent charcuterie is the only real reason to visit.